This pet food recipe has been carefully designed to give balanced nutrition to almost any creature native to the island. Includes plant fibers to help with digestion and egg to bind the mix. Kibble (Sarco Egg) is a Regular Kibble in ARK: Survival Evolved. 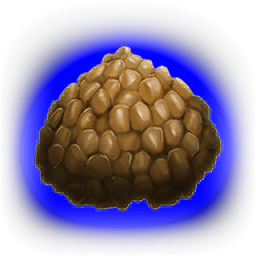 Previously, this Kibble was used to forcefully tame a Stegosaurus and the Tek Stegosaurus on PC and Console; however, it is still used to tame those Creatures on ARK: Survival Evolved Mobile (excluding the Creatures that are unreleased for that platform).. Currently, this Kibble is used to forcefully tame Anglerfish, Ankylosaurus, Baryonyx, Beelzebufo, Carbonemys, Carnotaurus, Dimetrodon, Doedicurus, Ichthyornis, Kaprosuchus, Kentrosaurus, Lymantria, Pelagornis, Pteranodon, Pulmonoscorpius, Purlovia, Sabertooth, Sarco, Stegosaurus, Terror Bird, Thorny Dragon, and Velonasaur and to passively tame Diplodocus and Gigantopithecus on PC and Console. Simply place it in its inventory when it's unconscious and it will eat one every time its hunger drops by 80 units. 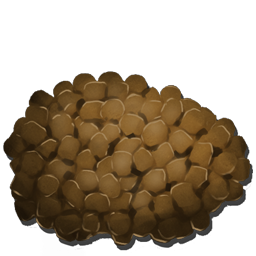 Super Kibble (Sarco Egg) is a type of Kibble exclusive to ARK: Survival Evolved Mobile. It can be crafted in a Cooking Pot or in an Industrial Cooker by substituting the normal Egg with a Super Fertilized Egg. Super Kibble (Sarco Egg) will tame a wild creature faster and with greater Taming effectiveness. This page was last edited on 10 March 2019, at 17:08.